I can't tell you how many times I've called Becky to find out what time I need to be home tonight or to ask what's going on this weekend? - I installed Google Calendar Sync on my work machine and selected 2 way synchronization through Outlook. Here are the benefits: Whenever Becky or I add en event, we can see it in near-real time on the Google Calendar. No more double-booking a weekend or coming home late with the girls have somewhere to be. Don't use Outlook or don't need to sync with just one person? 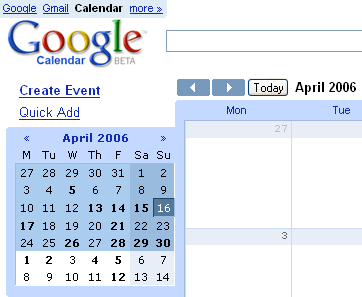 A Google Calendar can be shared publicly and published so your group/customers can have immediate access to all events. Do you have a different solution for sharing your information? Then give me some comment love!